Workers at TGI Friday’s restaurants in Milton Keynes (Stadium) and Covent Garden, London take their first ever strike action on Friday, May 18 in a dispute over tips and minimum wage abuses which could cost waiting staff £250 a month in lost wages. The workers voted by 100 per cent, on a 75 per cent turnout, to walk out. The American dining chain, which has 81 restaurants in the UK, will be hit with a series of 24-hour strikes starting on Friday, May 18 and continuing over consecutive Fridays during the summer. As Unite general secretary Len McCluskey explains in the video below, the dispute arose when the company introduced a new tipping policy with only two days’ notice. The policy would see money earned by the waiting staff redirected to top up the low wages of kitchen staff, a move driven by the need to stop the high turnover of kitchen staff. The move means waiting staff can lose up to £65 per week from their wage packets. The ballot results of workers at TGI Friday’s restaurants in the Trafford Centre, Manchester and Haymarket in London Piccadilly are due on Friday, May 11 2018, with the vote by workers at two restaurants in Gateshead Metro Newcastle and in Enfield, greater London closing on Friday, May 18 2018. “Given this overwhelming vote for action, TGI’s outrageous wage grab has clearly caused the workforce to say ‘enough’,” said Unite regional officer Dave Turnbull. 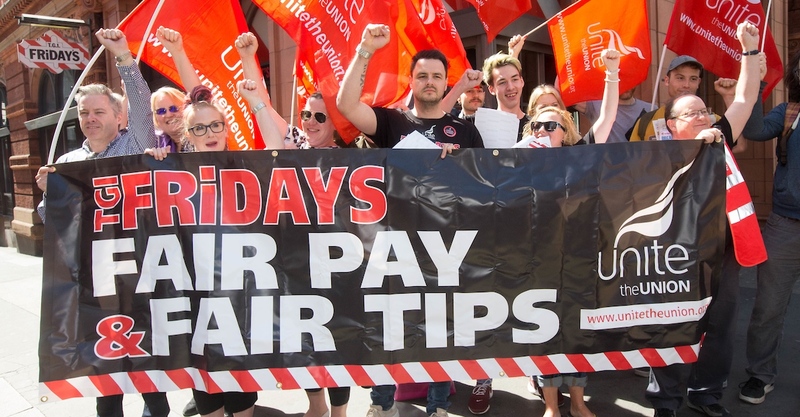 “Our members are also deeply offended by the company’s attempts to make out that they don’t want to share when the reality is that TGI’s don’t want to give kitchen staff a properly funded pay rise,” he added. 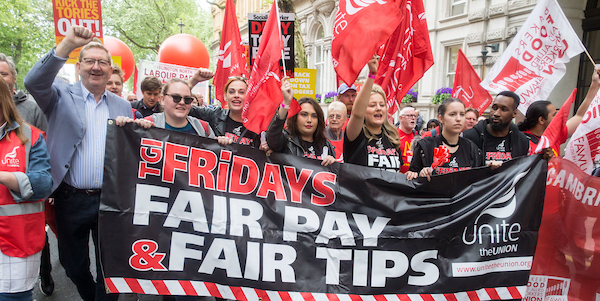 “TGI’s staffing problems are being caused by its poor pay policy, not poorly paid workers. “If they carry on like this then they will destroy the workforce’s trust and consumer confidence simultaneously,” Turnbull went on to say.